Find beautiful vacation rentals near Fort Myers Beach, Florida at Resort Harbour Properties. Located on the 10th floor, this beautiful condo was renovated in 2016 with vibrant greens, blues and incorporates driftwood accents. Breathtaking views from the screened-in private balcony are included along with 2 bedrooms, 2 baths a fully equipped kitchen and washer and dryer. You'll have 1 king in the master bedroom and 2 full beds in the guest bedroom, sleeping 6 adults comfortably with a sleeper sofa in the living room. This rental comes with Large TV's in every bedroom and living room, along with a DVD player in every room. Plenty of seating on the balcony, including a lounge chair, table with 4 chairs, and cocktail table. Inside you will find plenty of relaxing space and a desk to write your postcards to friends and family! That’s why our Sanibel Harbour condos for rent represent such a Great Value! You may have found this rental on HomeAway 7558369, HA ID 7558369, VRBO 7558369ha or Vacation Rentals 7558369. Fantastic Sunsets !!!!! Beds very comfortable. Clean and well maintained unit. Would rent again! I loved the condo, very nice and pretty. Exactly what the pictures and description explained. Very convent to stores and on site activities. Wish I couldve seen more dolphins in the bay! I know thats a hit and miss thing and we did see two dolphins one morning but that was all we seen! But loved the condo and the staff! The team was great when booking particularly as I had to call a number of times initially. Everyone was prompt and friendly. My family had an incredible stay at the property and I strongly recommend Resort Harbour Properties and would consider coming in the future. The location and room were stunning. We have stayed in #1014 Harbour Tower a number of times and were delighted with the recent upgrades. New flooring, carpets in the bedrooms, kitchen cabinets, appliances, furniture, TV's, crown molding, new inside doors...you get the picture. 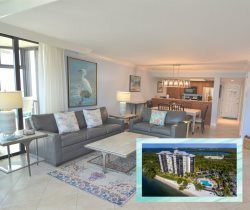 All the changes/dcor present a "beachy" feel to the condo which is appropriate given the location and the wonderful views from the lanai. Property management is very responsive when booking and the owners are lovely to deal with too. The property itself is well maintained and Sanibel Island is minutes away and there are many golf courses, restaurants, shops in the area to explore. Can't wait to return!